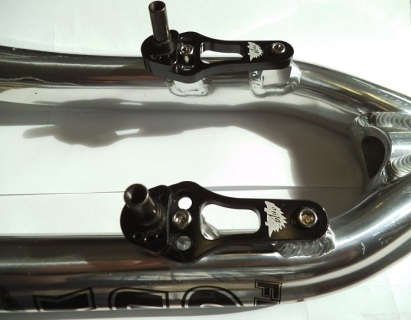 This 6061 tig welded alloy fork suits a multitude of purposes. Originally conceived as a light use competion Bicycle Trials fork, it has since proved its versatility over and over as it moved into most other disciplines requiring a light and rigid front fork. A one piece solid machined head tube with a 5 mm wall, butting to 8mm. 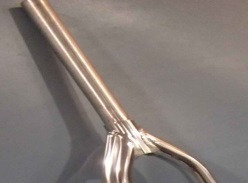 Beautiful tig welded construction and a super gloss polished finish give this superbly engineered fork a touch of class. Only available now in the Disc mount/ Magura Four Bolt mount version, this superb quality product is now legendary as an all purpose light weight fork. For non trial use it makes a great ride with your disc brakes. NOW HALF PRICE. PRICE INCLUDES UK, EUROPEAN OR WORLDWIDE DELIVERY. As Fly Guy description but includes Onza Vee Brake Adapters so is ready to use out of the box with Vee Brakes, Maguras or Disc Brakes.